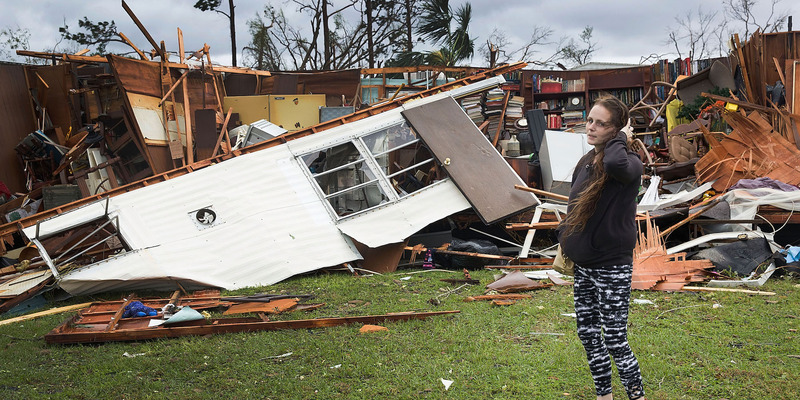 Joe Raedle/Getty ImagesA woman stands in front of what is left of one of her fathers trailer homes after hurricane Michael passed over Panama City on Wednesday. 320,000 people did not evacuate despite official orders and dire warnings as category-4 Hurricane Michael approached the Florida coast. Some people ignored the warnings, while others were not able as the storm rapidly intensified just before it hit the panhandle. Authorities said that the fate of about 280 residents who ignored evacuation orders was unknown. The storm was the worst recorded in the region and has killed at least two people. 320,000 people did not evacuate the path of Hurricane Michael as it approached the Florida coast, where it went on to devastate the coast and kill at least two people and leave 280 missing. More than 500,000 people were under mandatory evacuation notices or urged to find higher ground before the hurricane, the strongest ever recorded in the region, hit. Brock Long, the administrator of the Federal Emergency Management Agency, said that he expected the recovery process to be challenging, and the death toll to rise once areas that are now almost-inaccessible are reached. “People do not live to tell the tale about storm surge,” he wrote on Twitter. Michael caused storm surge of up to 14 ft.
Brad Kieserman, the Vice President of Operations and Logistics for the American Red Cross, said that 60,000 people evacuated to emergency shelters, mostly in Florida, Reuters reported. Andrew Lamonica, 64, a retired power company worker and lifelong Panama City Beach resident, told Reuters that he had ignored the evacuation order. But many people were not able to leave, for financial reasons or due to disability or illness. The storm also intensified extremely rapidly, leaving people scrambling to make plans – it transformed from a small tropical depression into a record-breaking Category 4 hurricane in just 72 hours. Search and rescue teams will work in the area from Thursday morning, FEMA said in a press conference. The storm has now moved beyond Florida and turned into a tropical depression as it moved over Georgia, and towards the Carolinas and Virginia.Hundreds of thousands of people are without power in those states, where states of emergency have been ordered. 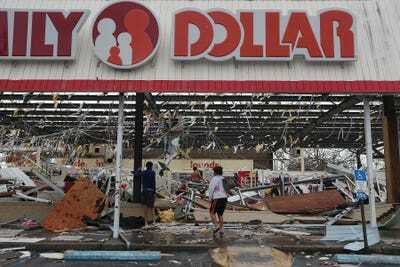 Joe Raedle/Getty ImagesPeople look at a damaged Family Dollar store. Kieserman said the number of people in emergency shelters number is expected to reach 20,000 across five states by the end of the week. About 3,500 Florida National Guard troops were deployed, along with more than 1,000 search-and-rescue personnel, Scott said. The Pentagon positioned more than 2,200 active-duty military personnel in the region, as well as helicopters, high-water vehicles, and swift-water boats.